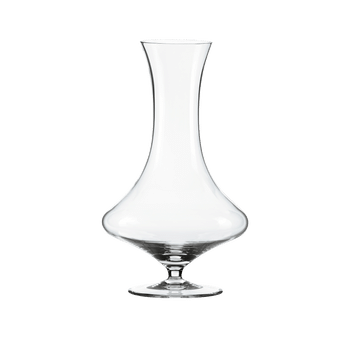 Home Shop RIEDEL Decanter Evechen R.Q. The handmade decanter distinguishes by an elegant and complex design. The Evchen decanter, a smaller but no less seductive and functional variant of the successful Eve decanter. Hand-formed and mouth blown by glassblowers, Evchen’s compact dimensions allow it to be easily stored away. Rotated once on its own axis, wine flows through the first chamber undergoing optimum aeration before the ideal quantity reaches the second chamber. This makes the act of serving wine easy as well adding to the wine tasting experience. RQ = this item is supplied as 'Restaurant Quality' meaning that it may contain small imperfections when compared to the same item in 'best quality' and, as such, is offered at a special purchase price exclusively for use in restaurants.